Harli Bari Care Designer Cushion Increased Comfort. Reduces pressure and increases comfort whilst sitting, for people at risk of developing pressure ulcers. Three part construction relieves pressure and prevents bottoming out. 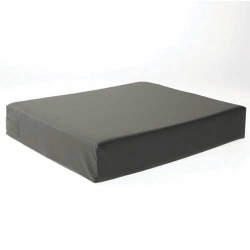 Firm foam base fused to a middle layer of high density foam for comfort and cushioning. Top layer of ultra visco elastic memory foam offers hugely improved pressure reduction. Features two way stretch vapour permeable cover, welded seams and anti slip base. Suitable for users with medium risk of pressure ulcers.